Finished Painting - Geranium in Watercolor! I have a new painting in progress and I wanted to share it with you. I used two different photo references for this piece, both taken from my own "stuff". One photo references the apple, napkin, and the bottom of the flower pot. The other photo was my reference for the flowers in the container. I want to make the apple and the napkin the focal point. I would like to keep the composition very simple. 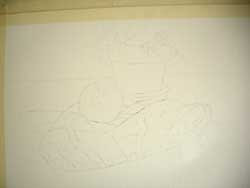 The drawing is transferred onto the paper using a graphite stick on the back of my drawing. Then I tape the 300 lb. Kilimanjaro paper to a foam core board. It's important to be sure at least 1/2 inch of tape covers the paper so that when it gets wet it doesn't lift the tape and curl the paper. I washed water over the image of the apple, leaving the areas I want to keep white dry. As I flow pigments into the water, I work to avoid the dry areas so the whites will stay crisp and clean. I use Permanent Rose, Permanent Alizarin Crimson and Aureolin Yellow with only a little water. I don't need much water because the colors will be diluted in the water that I have already applied to the paper to control the wash area. 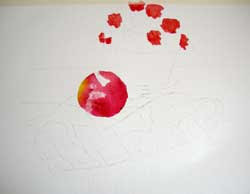 I have used Permanent Rose and Cadmium Red for the flower petals. And I applied them in a wet manner so the colors run together a little. More coming soon on this piece. You can follow this blog by clicking on the icon at the left of the page.